This plant appears in my garden late spring to early summer and dies down over winter. It sends new plants out by runners. 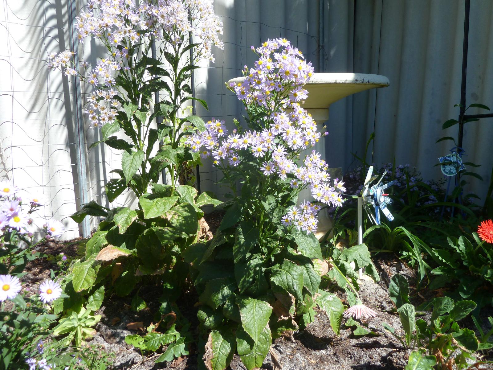 The foliage is rough and the flowers are blue with yellow centres and daisy like. In my garden it grows 4-5ft tall. Im not sure if this is a perennial or herb and cant remember where I purchased it from. I would appreciate it if someone could identify it for me so I can label it. Thank you Deirdre for your identification of my mystery plant. Heavens knows where I bought it from, I usually buy my plants from Bunnings. Comment on "Herb or Perennial"